I have made the case in a series of articles (here and here) that a vital part of the antidote to the continued hemorrhaging of believers and failure to attract new converts to the Roman Church is prayer with sacred art. Roman Catholics must once again learn to engage with art in their prayer worship, I believe, if we want the Church to grow faster. And this applies as much to traditionalists as it does to liturgical liberals. 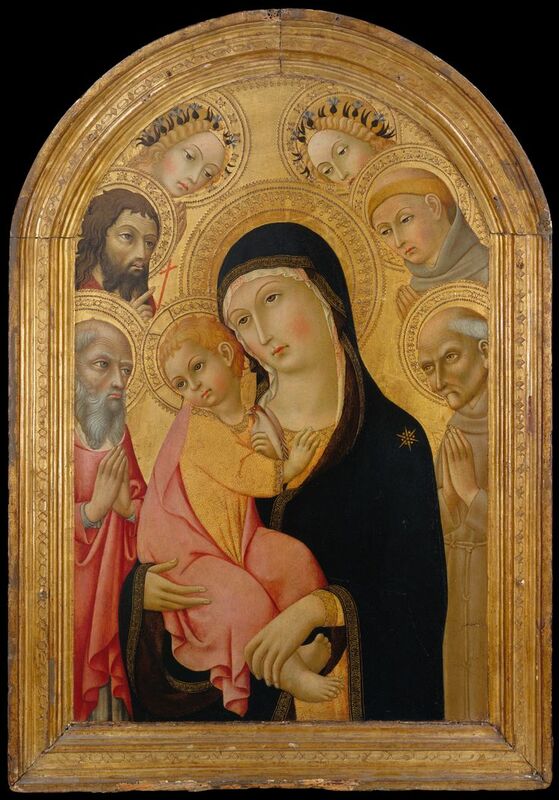 You can read a simple presentation of the argument here; and a discussion of how St Thomas Aquinas’ 4th Way helps us to understand why sacred art is so vital to the mission of the Church, here. In regard to how we pray with sacred art, the general principle I have outlined is that we pray as we would normally, but engage with art visually as we do it. This is especially important in the context of the liturgy. 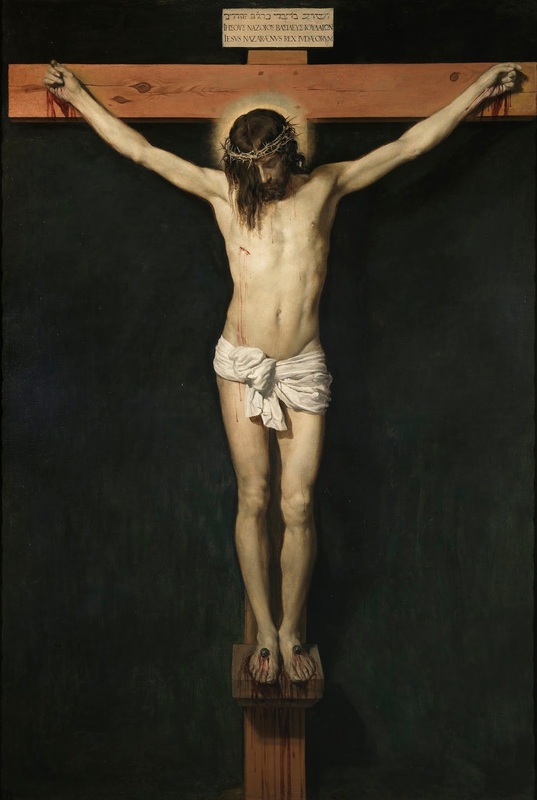 The simple statement of this is: pray with your eyes open and look at a painting as you do so. All the spiritual directors I have had have emphasized the importance of a balanced prayer life which consists of liturgical prayer, i.e. worship at the pinnacle, but also of devotions and para-liturgical prayer, structured prayer done with others, and then personal prayer. While each has value in isolation, the greatest value of the latter two is forming us for the highest form of prayer, which is the first in this list, liturgical prayer. Each of these different sorts of prayers can be done in conjunction with appropriate visual imagery, and will be enriched if we do so. When books that I have seen talk about prayer with images, they tend to focus on personal prayer, and usually meditation and contemplative prayer. This is good as far as it goes, but they are less helpful if they do not explain the value of this prayer in relation to our pattern of prayer in general and the liturgy in particular. Unfortunately, they usually do not do this. 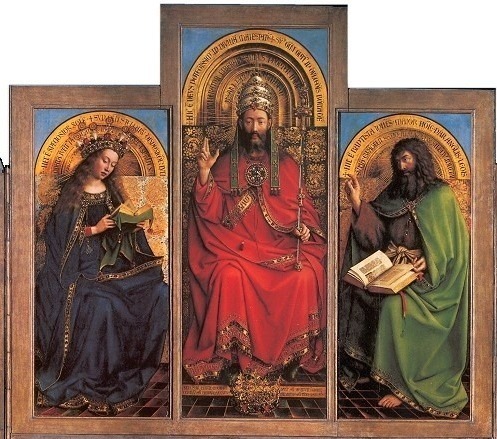 And again, the point should be made, that the techniques described for prayer with sacred art even in the meditation and contemplative prayer are not really very different from those methods used ordinarily without sacred art, the only difference is that one looks at an appropriate painting while doing it. Take for example a method of visual prayer based on the method of praying with scripture called Lectio divina. 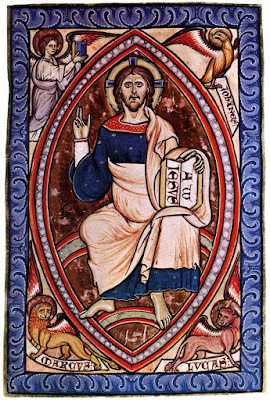 The link I supply here is a simple explanation of Lectio - without images - I found on a Carmelite website. One point to note in regard to the use of terminology is that since the days of The Beatles and their association with Maharishi Yogi, the words meditation and contemplation have often been used interchangeably; when people say they “meditate”, they often mean one of the methods of Eastern religions in which one seeks to eliminate thought. In the Sixties, this mode of prayer became fashionable, and a plethora of related meditation techniques were spawned, as all sorts of people tried to offer instant enlightenment for the price of a cup of coffee a day, or something similar. There are even new-age influenced “Christian meditation” methods still around today that began in this period. The intention might have been to draw those seeking nirvana away from Eastern religions and to Christianity by offering something similar, but Christianized; but because they don’t come out of the Christian tradition, they often have the opposite effect. They take Christians away from Christianity to what they see as the purer, older, more traditional form of this sort of meditation. “Meditation” in the Western Christian tradition is very different, as we can see from the simple explanation given by the Carmelites, above. First of all, meditation and contemplation are two different things. Meditation in the Western tradition, in contrast to the popular understanding of the word, is active - we direct our thoughts to the chosen subject, i.e. we think about something. Contemplation is perhaps closer to the popular idea of meditation, but although passive, we are alert to and receptive to the thoughts that occur. The common way of considering art is to analyze the content in detail, reading it as though it were scripture. I suggest that the images should be chosen to harmonize with liturgical practice. These could be images of the Feasts or Saint being celebrated on a particular day. 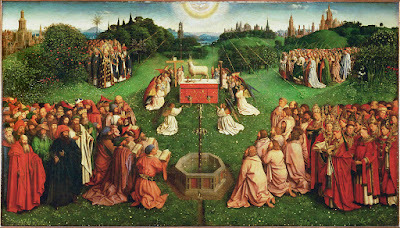 In the ideal (which of course almost never happens in Roman churches) there would be a painting placed in church for that Mass that day, the sight of which immediately brings to mind and compresses all the fruits of the earlier meditation and contemplation into a package that is presented to us in a single moment. An alternative is to consider general themes of salvation history which are re-presented to us every time we go to Mass. Themes in salvation history are a pattern of events that relate to each of us in our personal pilgrimage of salvation. Once we grasp the idea of the interrelatedness of all things, by understanding how particular and significant episodes in scripture are related to each other, it facilitates a mode of thinking by which we more naturally place our own story, and hence ourselves into that picture. So, for example, the crossing of the Red Sea relates to the Baptism of Jesus in the Jordan and the descent of the Spirit and then also our own sacramental Baptism and Confirmation, by which each of us dies and rises spiritually and receives the Spirit (1 Cor 10:1-5). Our foretaste of eternal life to come, like Israel eating manna in the desert on the way to the promised land, is our reception of Holy Communion, the pledge of our own future life and resurrection (John 6:54). Each of us has a story by which we die with Christ and as Christians are raised up with him too. I am reminded that this applies to me every time I walk into a church and cross myself with the holy water - ‘Jordan water’. Here is one that I do regularly, just to illustrate. It takes about 15 minutes of meditation and then I allow if I have time about the same for contemplation. I am not expecting anyone necessarily to do precisely what I do. Just from the passage above, you can see that there are alternative images to the ones that I have chosen below that one could focus on in order to enhance the subject of the meditation. Also, there are many expert theologians amongst you who could develop something far better, I am sure. My thought here is that it might encourage some of you to incorporate something like this into your own prayer lives in a way that will nourish your faith and worship. If you can come up with something than this, then please go ahead! So my program has eight meditations. I have offered one image per meditation, but there could be more than one some cases as you will see. I have prints of examples of these prototypes in my own icon corner at home and I look at them as I consider each one. I have done this often enough that if I meditate without the images, they appear strongly in my imagination. This little series of meditations takes me on a path that begins in the world and the leads me into the heavenly realm of the Mass and then I return to the world to complete the cycle. First, by Holy Spirit and the prayers of the saints and Our Lady, I come to Christ. 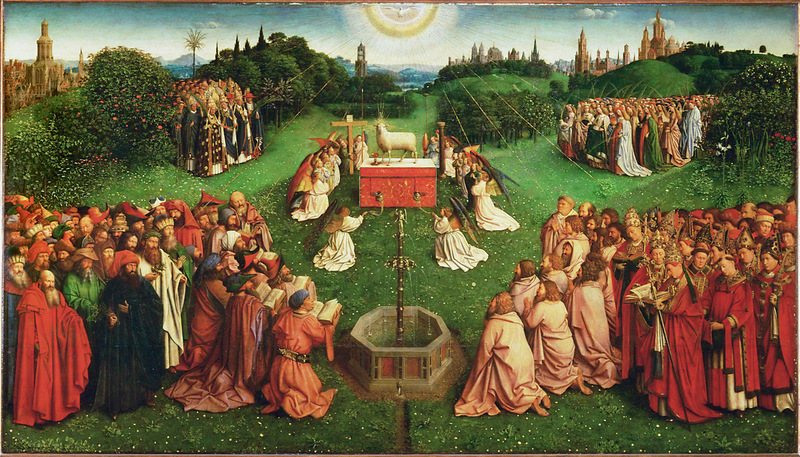 Then through the triple sacraments of baptism, confirmation, and communion I enter into the mystery of the Trinity, partaking of the divine nature, and finally I go out into the world, to love and serve God and my fellows and, one hopes, better able to draw them to the Church each time this cycle is repeated. Each meditation uses the following structure: first, a statement that characterizes the image I am looking at, second a short hymn of praise (I have memorized Psalm 116(117)), third penitence, fourth petitions. Then there is a brief contemplation in which I repeat slowly the Jesus prayer eight times, ever quieter in my mind, before moving on to the next image. 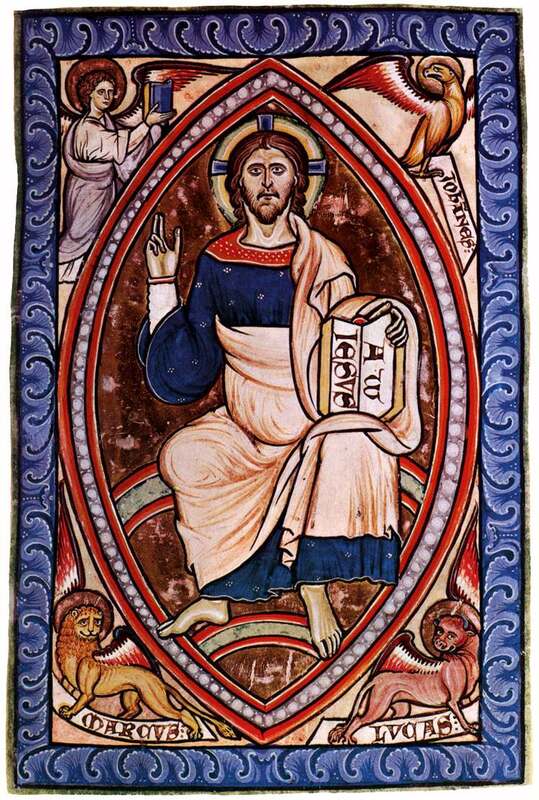 After the eight meditations are finished, I then I repeat the Jesus Prayer to myself, allowing it to become quieter and quieter as a thought in my mind - I imagine someone else saying it and that I am listening. I observe the thoughts that pop into my mind as I do this. If the train of thought is good I run with it and might even write a note down if I want to remember it. If it is bad, I return more actively to thinking the Jesus Prayer until it is eliminated. Before I start I do a short meditation of gratitude - in which I list 10 or so items from the day that are good and thank God for them and a review of conscience in which I acknowledge my sins and ask for forgiveness. 1. Blessed be God. Father, Son, and Holy Spirit. Three persons and one God. Psalm 116 (117): O praise the Lord all ye nations, praise him all ye peoples, for his merciful kindness is more and more toward us; and the truth of the Lord endureth forever. Prayer: Father, may the Holy Spirit lead me to Jesus, in Jesus Name, Amen. 2. Blessed be God, in His angels and in His Saints. Prayer: Please you saints and angels in heaven, pray for me to Lord our God, that I may have all that I desire and all that is good for me, but only in accordance with His will. Father, hear our prayers, in Jesus Name, Amen. 3. Blessed be the great Mother of God, Mary most holy. 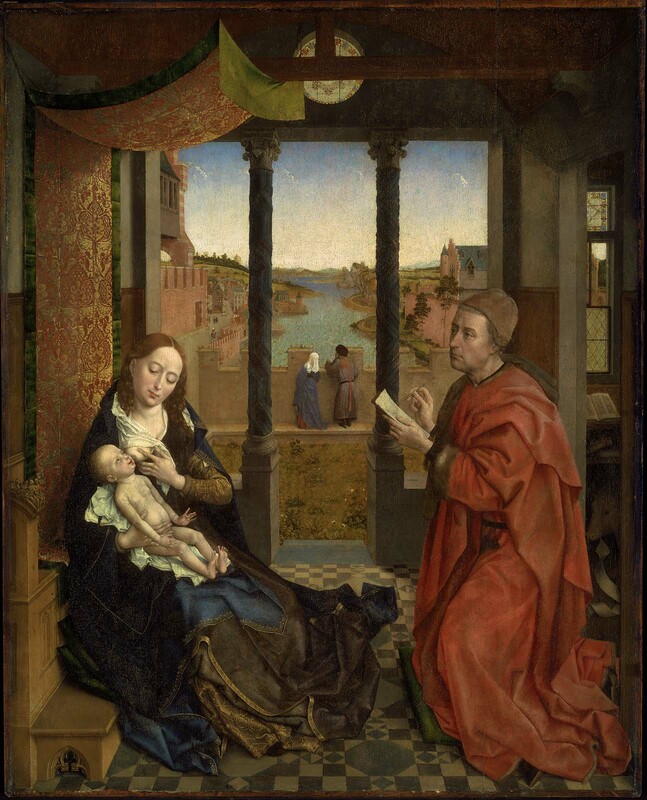 Prayer: Mary, Mother of God, please show me your Son, and pray for me to Lord our God, that I may have all that I desire, and all that is good for me, in accordance with His will. Father, hear our prayers, in Jesus Name, Amen. 4. 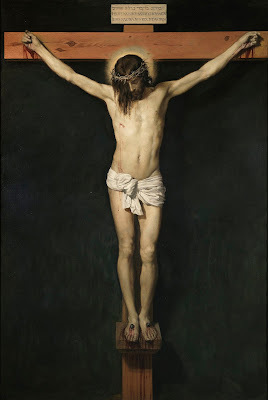 Blessed be Jesus Christ, True God, and True Man. Behold the Lamb of God. 5. Blessed be Jesus Christ, risen from the dead, my Lord and my God. 6. 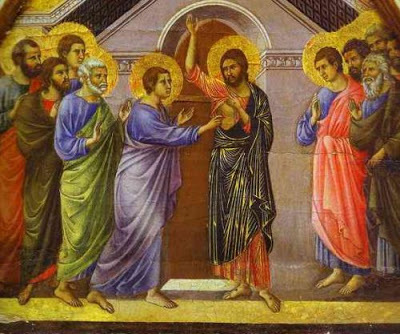 Blessed be Jesus Christ, ascended into heaven and seated at the right hand of the Father, and the Holy Spirit the Paraclete descending upon us. 8. Blessed be Jesus Christ and His Mystical Body, the Church. 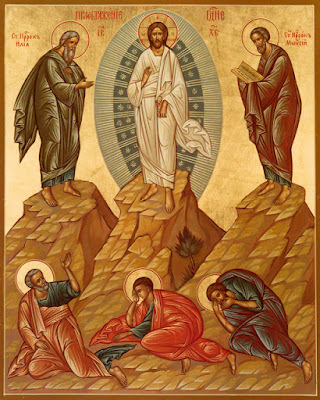 Transfigured and shining with uncreated light. Then the contemplation stage begins. I always repeat Jesus Prayers as described in order to eliminate distraction, while being alert to other thoughts that crop into my mind.